Fantasy novels and stories cast a spell on readers, with their vivid worlds and complex characters. But just like any other kind of spell, there are different types, and rules. You need a magical lexicon. So here are 10 commonly used terms you'll need to know, that describe the different sorts of fantasy worlds and stories. C.S. Lewis' Narnia is a perfect example of a "portal fantasy," in which somebody goes through a gateway or portal, and winds up in a magical world, where everything is different and wonderful. Wizard of Oz is another example, where the portal is not literally a portal. Instead of encountering magic in our world, or starting out in the other world, the protagonist travels from our world to the magical place. Often, the portal fantasy involves a heroic quest of some sort. According to Farah Mendelsohn, the opposite of "portal fantasy" is "intrusive fantasy," where something magical breaks through and comes to our world. There's also "liminal fantasy," where someone doesn't quite cross through the gateway, but just stays on the border between our world and the world of magic and adventure, causing leakages in both directions. A "secondary world" is a place that's entirely magical, like fairyland: the sort of place where fairytales happen. When this term was coined by J.R.R. Tolkien in his essay "On Fairy Stories," secondary worlds often included "lost continents" like Lemuria or Atlantis, or other undiscovered magical places on Earth. But nowadays, when people talk about secondary worlds, they usually mean someplace that's basically another planet, like Westeros. An Earthlike planet where there are (usually) humans and a culture that's vaguely recognizeable to humans, but it's not just an alternate-history version of Earth. Like Westeros, for example. When you stop to think about it, it's kind of odd that there are so many Earthlike planets where humans live in socities that resemble European (or sometimes Asian) history — but it's one of the conventions of the genre. Image: Kerembeyit/Deviant Art. An epic fantasy is a long story, told over several volumes, and it usually takes place in a secondary world — or at least, an epic tends to be an "immersive fantasy," which means that you start out fully immersed in the magical world from the beginning. (In an immersive fantasy, nobody goes through a portal or has magic intrude on the normal world — people just live in the world where magic exists.) An "epic poem" is a long narrative poem, that features legendary heroes, and Tolkien's Middle-Earth saga was seen as an attempt to "synthesize the epic that Old (i.e., pre-Norman Conquest) England never had," says scholar and author Brian Stableford. After the success of Robert Jordan and George R.R. Martin, publishers put out a ton of epic fantasy series in the late 1990s and early 2000s. Image from Lin Carter, Imaginary Worlds. Another term that's used somewhat interchangeably with "epic fantasy" is "high fantasy" or "heroic fantasy," both of which connote something a bit fancy. According to Stableford, the term "heroic fantasy" was coined by "critics who thought sword and sorcery sounded too downmarket while fantasy was struggling to assert its independence as a genre." "High fantasy" was coined by Chronicles of Prydain author Lloyd Alexander, to describe a fantasy that takes place entirely in a secondary world. So what is "sword and sorcery," and why was it considered "too downmarket" when "heroic fantasy" was considered a saleable genre? 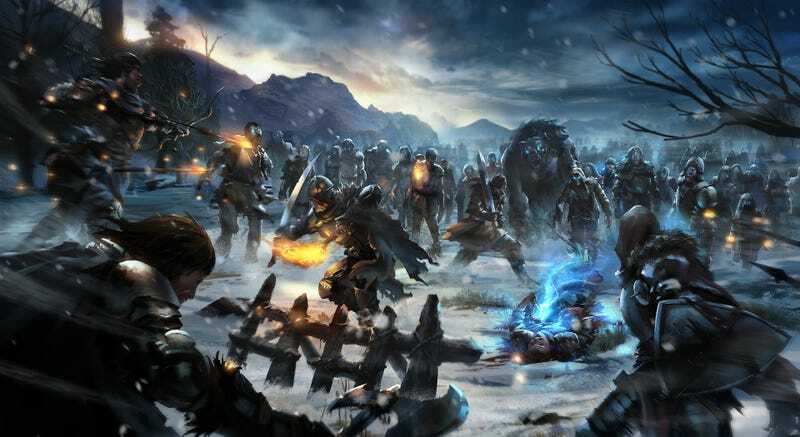 Basically, as Pyr Books editor and Frostborn author Lou Anders is fond of saying, it's like Dungeons & Dragons — in fact, Dungeons & Dragons and similar RPGs may have kept sword and sorcery alive, as a genre, while everybody was doing heroic fantasy instead. Sword and sorcery is less "heroic" than heroic fantasy, and tends to include a lot more rogues and thieves. Heroic fantasy takes place in the palace, sword and sorcery takes place in the dark understreets of the city. Fritz Leiber's Fafhrd and the Gray Mouser stories are classics of the genre, but early practitioners include Robert E. Howard, Clark Ashton Smith, Lord Dunsany and C.L. Moore. L. Sprague deCamp edited a 1963 anthology called Swords & Sorcery, that includes all the classics. Basically, it's a fantasy story that takes place in the city — often, a modern city, rather than a Medieval or Victorian one. This city is often in "our" world — and in fact, I've heard "urban fantasy" used as a shorthand for "an immersive fantasy that takes place on Earth rather than on a secondary world." If it takes place in New York or London, it's an Urban Fantasy. But in fact, a lot of the tropes of urban fantasy, such as a hero living in a society that includes vampires and witches among normal people, often take place now in small towns or suburbs — think The Vampire Diaries' Mystic Falls. So some people have suggested that we start using the term "suburban fantasy" or "rural fantasy" to describe these — or just admit that "urban fantasy" doesn't have to be urban. Long before Tolkien or Lord Dunsany, there were magical stories being passed down through the oral tradition — including "forms from major to minor such as epics, myths, legends, fairytales, fables, proverbs, riddles, songs, jokes, insults, and toasts to nursery rhymes," as Julie Carthy puts it. Every culture has folklore, and it provides the basis for a lot of fantasy storytelling — there are fairytales, such as the Brothers Grimm went around collecting and synthesizing. And there are fables, which are stories for children with a clear moral lesson at the end. And folk-tales or folk-legends, which purport to be real stories about something that happened locally, in the past. These stories give us a lot of motifs that stick with fantasy storytellers, from the troublesome giant to the wicked stepmother. Magic realism (or "magical realism") usually refers to literary fiction where magic is part of everyday life, and there's a touch of the surreal about the storytelling. Magic isn't something separate and different from everything else, but just an extension of the real world. According to Stableford, the term was first used to describe the poetry of Pablo Neruda, but became widely known with the popularity of Gabriel Garcia Marquez's novel One Hundred Years of Solitude. Many of the most famous practitioners of magic realism are Latin American, although the term has been used to refer to other authors — for example, Kelly Link's dreamlike storytelling is often referred to as "magic realism." In a nutshell, gothic fantasy contains a lot of supernatural horror elements, such as ghosts or vampires or other monsters — but there's also an element of romance, such as a romantic hero. Plus a decaying, ruined, formerly-grand setting and a sense of encroaching despair. Gothic fantasy is also sometimes called "dark fantasy," especially if it takes place in a secondary world. Gothic literature doesn't need to include fantastical elements — for example, Southern Gothic literature, as written by William Faulkner and Eudora Welty, includes elements of the grotesque without any supernatural elements. But a common denominator in gothic fiction is the sense of dread, and the danger of succumbing to madness. Image: Elise Kroese. Back in the day, supernatural horror fiction was often referred to as "gothic" fantasy — but if it got weird enough, like the stories of H.P. Lovecraft, then it was called "weird fiction." Basically, horrific tales of strange creatures and somewhat inexplicable encounters, with a fantastical edge to them. And in the past 20 years, people have started talking about a genre called the "New Weird," which blends together science fiction, fantasy and horror with a distinctly literary edge to it. People were trying to jumpstart this subgenre in the 1990s — but it received its foundational text in 2000, when China Miéville published Perdido Street Station, a novel set in a secondary world featuring bizarre creatures, an arcane science and a horrifying arc. Since then, editors Ann and Jeff VanderMeer have championed the idea of the New Weird, publishing an anthology of stories that take Lovecraftian motifs into a more stylistically ambitious direction. There's some overlap between "New Weird" fiction and "Slipstream," which is a term for genre-blending storytelling with literary ambitions. Lately, you hear a lot of people talking about "grimdark" fantasy. This is, essentially, fantasy that takes place in a secondary world that's dark and edgy and excessively violent. Featuring anti-heroes or morally gray heroes, and a lot of brutality. People point to authors like Richard K. Morgan and Joe Abercrombie as examples of the new wave of "grimdark" writing. Over here, Morgan reacts to "grimdark" as being a pejorative term that includes not only his work and Abercrombie's, but also George R.R. Martin's Westeros novels. I'm not sure if "grimdark" is always used pejoratively, but there are certainly many of us who like that sort of thing and use the label approvingly.